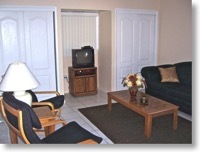 Our apartments are VERY nice, comfortable, and Extremely clean. 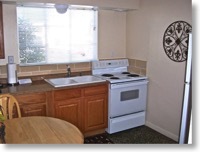 We have three sizes ranging from studios to nice size one bedrooms. We keep our apartments VERY nice and “EXTREMELY” clean. We receive many compliments on them. Each of the three red brick duplexes, (2 units per building) have tile floors and textured walls, which we keep clean and freshly painted. Because they are brick, block and concrete, they are very quiet. Our guest tell us they prefer our individual units over being in a large complex with strangers all around them. 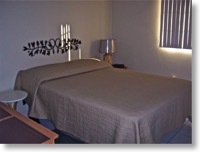 Each unit has a private entrance and a private parking spot right next to your door. It is a nice, quiet, and safe place to live, because we (the owners) live here too, and want our home to be nice place for us, as well as our guests.